Matteo Ricci (October 6, 1552 – May 11, 1610) (利瑪竇, |利玛窦 Lì Mǎdòu, Li Ma-tou, Li Madou; courtesy name: 西泰 Xītài) was an Italian Jesuit priest and missionary who introduced Christianity and Western ideas to the Chinese Empire in the sixteenth century. He was a pioneer in adapting to the culture and traditions of a society in order to introduce Christianity. Arriving in Macao in 1582, Ricci began learning the Chinese language and customs, and eventually mastered Chinese classical script. He attracted the interest and gained the respect of Chinese officials and scholars by demonstrating his knowledge of astronomy, mathematics and geography, and by introducing them to European clocks, prisms, astronomical instruments, oil paintings, musical instruments, picture books and architectural drawings. At first Ricci wore the attire of a Buddhist monk, but after realizing that Confucianism was dominant in the Ming dynasty, he dressed instead as a Chinese scholar. 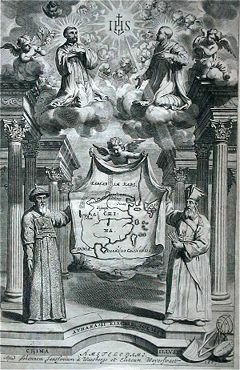 Ricci produced the first world map in Chinese, and wrote a number of Christian works in Chinese. He also made the first translation of Confucian texts into a European language, Latin. In 1601, Ricci became the first foreigner from the West to enter the Forbidden City, and was granted permission to establish a mission in Peking. In addition to establishing Christianity in China, he showed Chinese scholars that foreign countries were not barbaric. He also disseminated Western ideas to a Korean emissary, Yi Su-gwang, who later helped shape the foundation of the Silhak movement in Korea. Ricci was a pioneer in distinguishing between religion and culture and recognizing that it was possible for people to become Christians without having to adopt European culture at the same time. He was a model missionary in that as much as was possible he put aside his own culture and nationality and identified himself completely with the people that he was living with. He learnt Chinese, familiarized himself with the Chinese classics and dressed as a Chinese scholar. He sought to present Jesus and his teachings in a way that could easily be accepted by the Chinese people and did not arrogantly condemn traditional Chinese religious practices out of hand. Unfortunately in the Chinese Rites Controversy, Dominican, and Franciscan missionaries who came to China later, accused the Jesuits of compromising the Christian faith by adapting it to the Chinese culture. The resulting discord led to all the missionaries being expelled. 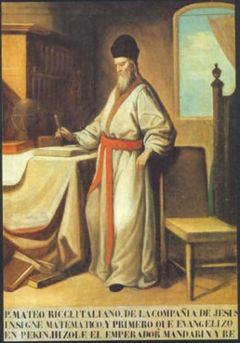 The methodology of Matteo Ricci remained suspect until 1958, when Pope John XXIII, by decree in his encyclical Princeps Pastorum, proposed that Ricci become "the model of missionaries." Matteo Ricci was born October 6, 1552, in Macerata, then part of the Papal States, to the noble family of Giovanni Battista Ricci, a pharmacist active in public affairs who served as governor of the city for a time, and Giovanna Angiolelli. Matteo, their oldest child, studied first at home and then entered a school that was opened in 1561 by the Jesuit priests in Macerata. He completed his classical studies, and at the age of 16, he went to Rome to study theology and law in a Jesuit school. There on August 15, 1571, he requested permission to join the Jesuit Order. In 1577, soon after he had begun the study of science under the mathematician Christopher Clavius, he applied to become a missionary to India. He went to Portugal, where he studied at the University of Coimbra while he waited for passage. On March 24, 1578, he left Lisbon, arriving on September 13 at Goa, the Portuguese colony on the central west coast of India. Here he continued his studies for the priesthood, and in 1580 he was ordained at Cochin, on the Malabar Coast, where he had been sent to recover his health. In 1582, he was dispatched to China. Matteo Ricci (left) and Xu Guangqi (徐光啟) (right) in the Chinese edition of Euclid's Elements (幾何原本). By the sixteenth century, the early Nestorian Christian communities founded in the seventh century and the Catholic missions of the thirteenth and fourteenth centuries had vanished, and Christians were non-existent in China. After the death of Francis Xavier in 1522, numerous attempts by missionaries to enter China had failed. Finally, Father Alessandro Valignano, who had received Ricci into the Jesuits and was at this time visitor of the Jesuit missions in the Far East, established a new method of evangelizing by adapting to national customs. In 1579, he sent Father Michele de Ruggieri to Macao, a Portuguese trading post in Southern China, with instructions to study the Mandarin language. In 1582, Ricci arrived in Macao to start learning the Chinese language and customs. These Jesuits were men whose vision went far beyond the Macao status quo, priests serving churches on the fringes of a pagan society. They were possessed by a dream - the creation of a Sino-Christian civilization that would match the Roman-Christian civilization of the West. 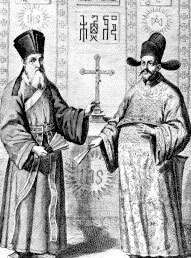 Michele Ruggieri and Matteo Ricci were both were determined to adapt to the religious qualities of the Chinese: Ruggieri to the common people, in whom Buddhist and Daoist elements predominated, and Ricci to the educated classes, where Confucianism prevailed. This policy was largely devised by the scholarly Ricci. Earlier he had discovered through his studies of Confucius that the Chinese originally had a monotheistic concept of a Supreme Being. He reasoned using this as the basis for presenting the Gospel to them. Ricci sought out friends among Chinese scholars and shared his enthusiasm for Confucius. The more he conversed with them, however, the more aware he became of the need for a special type of missionary to implement his methodology. Furthermore, he saw that this new type of approach would require a special dispensation from the Pope. This was granted. Ricci then wrote to the Jesuit houses in Europe and called for priests - men who would not only be "good," but also "men of talent, since we are dealing here with a people both intelligent and learned." A few responded, and Ricci began to train them so that they might approach the Chinese authorities, offering the court scholarly and scientific assistance with the deliberate intention of making a Confucian adaptation of their style of life, patterns of thought, preaching and worship. They were determined to completely de-westernize themselves. Both Ricci and Ruggieri felt that it would be possible to "prove that the Christian doctrines were already laid down in the classical works of the Chinese people, albeit in disguise." Indeed, they and their followers were convinced that "the day would come when with one accord all missionaries in China would look in the ancient texts for traces of primal revelation". So as not to occasion any suspicion about their work, the fathers [the Jesuits] initially did not attempt to speak very clearly about our holy law. In the time that remained to them after visits, they rather tried to learn the language, literature, and etiquette of the Chinese, and to win their hearts and, by the example of their good lives, to move them in a way that they could not otherwise do because of insufficiency in speech and for lack of time. "The work of evangelization, of making Christians, should be carried on both in Peking and in the provinces… following the methods of pacific penetration and cultural adaptation. Europeanism is to be shunned. Contact with Europeans, specifically with the Portuguese in Macao, should be reduced to a minimum. Strive to make good Christians rather than multitudes of indifferent Christians… Eventually when we have a goodly number of Christians, then perhaps it would not be impossible to present some memorial to the Emperor asking that the right of Christians to practice their religion be accorded, inasmuch as is not contrary to the laws of China. Our Lord will make known and discover to us little by little the appropriate means for bringing about in this matter His holy will. When questioned by the mandarins, the missionaries would say that “they were religious who had left their country in the distant West because of the renown of the good government of China, where they desired to remain till their death, serving god, the Lord of Heaven." However, the missionaries never hid their faith or their Christianity, and as soon as they were settled in Chao-k'ing, they put a picture of the Virgin Mary and the infant Jesus in a conspicuous place where all visitors could see it. Most inquired about the image, and the missionaries were able to give an initial explanation of Christianity. The missionaries appealed to the curiosity of their Chinese acquaintances by making them feel that they had something new and interesting to teach, using European items like clocks, prisms, astronomical instruments, oil paintings, musical instruments, picture books and architectural drawings to attract interest. Soon their house was constantly filled with educated visitors, who "all came by degrees to have with regard to our countries, our people, and especially of our educated men, an idea vastly different from that which they had hitherto entertained." It was in Zhaoqing, in 1584, that Ricci composed the first map of the world in Chinese, the “Great Map of Ten Thousand Countries,” at the request of the Governor of Chao-k'ing, who printed copies for his friends. In 1589, after being expelled from Zhaoqing (Chao-ch'ing), Ricci moved to Shao-chou (Shiuhing), where he taught mathematics to the Confucian scholar Ch'ü T'ai-su, receiving in exchange an introduction into the society of the mandarins and Confucian scholars. Ch'ü T'ai-su advised him to change his apparel from the habit of a Buddhist monk to that of a Chinese scholar. In 1595, Ricci reached Nanking, with the intention of establishing himself in the Imperial city of Peking. He formed a Christian church at Nan-ch'ang, capital of Kiang-si, where he stayed from 1595 to 1598. There he befriended two princes of royal blood, and at the request of one of them, wrote his first book in Chinese, “On Friendship.” In September of 1598, he successfully tried to meet the Emperor, but a conflict with Japan at the time of Japan's Korea War: Second Invasion (1696-1698), had made all foreigners objects of suspicion, and he was not successful in reaching the Imperial Palace. He returned to Nanking in February of 1599, and found that the political climate had changed; he was now welcomed by the government officials. He occupied himself chiefly with astronomy and geography, finding that this made a deep impression on the Chinese scholars. Although he was successful in Nanking, Ricci felt that the mission in China would not be secure until it was established in Peking, with official authorization. On May 18, 1600, Ricci again set out for Peking. He was not initially granted an audience with the Emperor of China but, after he presented the Emperor with a chiming clock, Ricci was finally allowed to present himself at the Imperial court of Wan-li. He entered on January 24, 1601, accompanied by the young Jesuit, Diego Pantoja. Ricci was the first Westerner to be invited into the Forbidden City. Although he never met the Emperor, he met important officials and was given permission to remain in the capital. Ricci stayed in Peking for the rest of his life. His efforts to proselytize brought him into contact with Chinese intellectuals such as Li Chih-tsao, Hsü Kuang-ch'i, and Yang T'ing-yün (known as the “Three Pillars of the Early Catholic Church” in China), who assisted the missionaries with their literary efforts, and Feng Ying-ching, a scholar and civic official who was imprisoned in Peking. Ricci wrote several books in Chinese: “The Secure Treatise on God” (1603), “The Twenty-five Words” (1605), “The First Six Books of Euclid” (1607), and “The Ten Paradoxes” (1608). He composed treatises adapted to the Chinese taste, using examples, comparisons, and extracts from the Scriptures and from Christian philosophers and doctors. His "T'ien-chu-she-i" (The Secure Treatise on God) was reprinted four times before his death, and twice by the Chinese. This work induced Emperor K'ang-hsi to issue an edict of 1692 granting Christians liberty to preach the Gospel in China. The Emperor Kien-long, who persecuted the Christians, nevertheless ordered the "T'ien-chu-she-i" to be placed in his library as part of a collection of the most notable productions of the Chinese language. Ricci’s success in China was due to his ability to understand the Chinese and to go beyond barriers of culture and language. Ricci learned to speak and write in ancient Chinese, and was known for his appreciation of the indigenous culture of the Chinese. During his early life in China, he referred to himself as a Western Monk, a term relating to Buddhism. Later, he discovered that in contrast to the cultures of South Asia, Confucian thought was dominant in the Ming dynasty and Chinese culture was strongly intertwined with Confucian values. Ricci became the first to translate the Confucian classics into a western language, Latin; in fact "Confucius" was Ricci's own Latinization. He came to call himself a "Western Confucian" (西儒). The credibility of Confucius helped Christianity to take root. 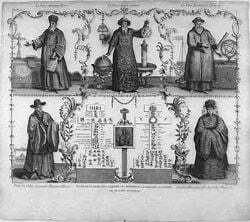 Ricci’s dissemination of Western knowledge about mathematics, astronomy and geometry also helped to protect Christian missions in China until the end of the eighteenth century, because the Chinese government wished to profit from the missionaries. Ricci also met a Korean emissary to China, Yi Su-gwang, to whom he taught the basic tenets of Catholicism and transmitted Western knowledge. Ricci gave Yi Su-gwang several books from the West, which became the basis of Yi Su-gwang's later works. Ricci's transmission of Western knowledge to Yi Su-gwang influenced and helped shape the foundation of the Silhak movement in Korea. While advancing to Peking, Ricci trained fellow workers to continue his work in the cities he had left. By 1601, the mission included, besides Peking, three residences in Nanking, Nan-ch'ang, Shao-chow, each with two or three Jesuit missionaries and catechists from Macao; another residence in Shang-hai was added in 1608. By 1608, two thousand Christians had been baptized in China. When Ricci died on May 11, 1610, more than two thousand Chinese from all levels of society had confessed their faith in Jesus Christ. Unfortunately, however, Ricci's Jesuits were largely men of their times, firmly convinced that they should also promote Western objectives while planting the Roman Catholic Church in China. As a result, they became involved with the colonial and imperialistic designs of Portugal. ↑ George H. Dunne, Generation of Giants: The Story Of The Jesuits In China In The Last Decades Of The Ming Dynasty (reprint ed. Kessinger Publishing, 2007), 28. ↑ Leonard M. Outerbride, The Lost Churches of China (Westminster Press, 1952), 85. ↑ Johannes Beckmann, SMB, A Theological Dialogue between the Christian Faith and Chinese Belief (1962), 124-130. Beckmann, Johannes, SMB. A Theological Dialogue between the Christian Faith and Chinese Belief. 1962. Fairfield University: Matteo Ricci, S.J. This page was last modified on 20 August 2018, at 16:41.